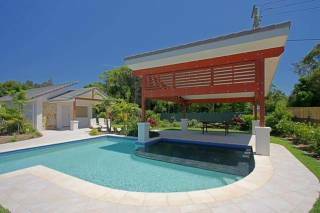 Away on Seaview is a recently renovated home featuring 6 bedrooms and 4 bathrooms with all of the luxuries you'd expect for a hassle-free holiday. All furnishings are beautifully appointed for your comfort and to match the unique style of Byron Bay. The facilities are suitable for groups or families. The property is in town in a private and quiet location and is a short walk to Byron's famous beaches, great restaurants, cafés and boutique shopping. The Green Garage is just around the corner where you can purchase incredible food, coffee, and groceries 7 days a week. You can enjoy your holiday without a car here at Away at Seaview because everything you need for the perfect Byron Bay holiday is at your fingertips. With a large rustic dining table, you can be sure to have many enjoyable nights cooking and entertaining with your whole group without being separated as the communal areas have a great open flow and polished wooden floors running throughout. We look forward to welcoming you to 'Away on Seaview Street'. The access codes to gain entry to the premises will only be made available to you upon full payment and only after the bond has been processed. Booking commences at 2.00 pm on the arrival date and check-out time is 10.00am on departure date. Late checkouts can be provided on written request. The owner accepts no responsibility for personal property left on the premises. Guests are responsible for all damages to the premises or, loss of or damage to any items in the premises. Please notify us immediately should any breakages, damage or loss occur during your stay. Loss of room keys and remote control garage keys (away on Massinger/away on Belongil Fields) will incur a charge of $80 per key and will be deducted from your bond. The owner reserves the right to withhold the costs of repairs or replacements from the tenant’s bond. Use of the first aid kit will incur an automatic 30$ fee. The person making the booking must stay in the property and will be held responsible for the conduct of all guests. Exceeding maximum numbers or having different numbers than stipulated on the booking form will render the guest liable to cancellation of the booking immediately. Guests are not permitted to bring animals or pets onto the premises.. Smoking inside the house is not permitted. Additional cleaning costs will be charged to guests who do so. Any cigarette butts found discarded outside will incur an additional cleaning cost to be deducted from the security bond. At the end of your stay, all rubbish should be placed in the wheelie bins provided in the outside rubbish area. Any excess rubbish left on the property that does not fit into the bins provided will be subject to a removal fee. Excess rubbish includes cigarette butts and bottle tops lying in and around the property. A minimum fee of $55 will be charged for excess rubbish. Cancellations less than eight (8) weeks prior commencement date forfeit 30% of the full tariff. Cancellations less than six (6) weeks prior to commencement date forfeit the full tariff. Cancellations must be forwarded to us in writing. A $190 cancellation fee will be charged on other cancellations beyond these dates. In the case of any problem or complaint, it is important that the guest informs us at the earliest opportunity in order that we have the chance to rectify the situation as quickly and efficiently as possible. We are available 24 Hours a day on 0419 335 917. Any complaint, which cannot be resolved locally, must be notified in writing within three (3) days of the end of service provided. If the guest fails to follow this procedure this may hinder our ability to rectify the complaint and reduce or extinguish any claim the client may have. Refunds cannot be given for events out of control of the owner. Events include, but are not exclusive to; cyclones, war, pool motors that break down, landslides, insect infestation, floods, ferry breakdowns, plane cancellations, demonstrations, civil unrest and any other unusual events. The owners will try to rectify any problems as soon as possible and within reason. Prior to checking out, guests are required to ensure all dishes and crockery are washed and the property is left in reasonable condition. Additional cleaning required above and beyond the standard clean will incur a fee, e.g. coffee stains, marked walls, glass or odd items in the pool etc. A full check out requirement list is available to view at the property on your arrival, however, should you wish to preview the conditions, and we can forward a copy on request. A fee of $100 per hour will be charged for departures later than 10 am, unless previously arranged by written confirmation. No noise between 8:00 pm to 8:00 am. AWAY at Byron Bay premises are strictly no noise houses. The properties are located within residential areas. Disturbance to our neighbours, including excessive noise, is prohibited and unacceptable 24/7. Noise means any sound that can be heard from neighbouring properties that disturbs their peace and quiet. Tenants must not create any noise during arrivals and departures or throughout their stay. If we receive a noise notification and find there has been any kind of party or gathering in the apartment, our licence requirements require us to evict at that point, regardless of the time of day, or night. We don’t give warnings or any refund of the booking fee. The full amount of the security bond may be forfeit upon excessive noise at any of the Away at Byron Bay properties. 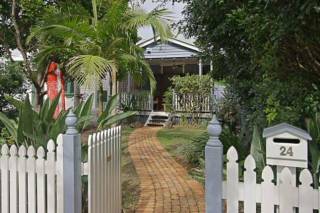 Away at Byron Bay provides family-friendly and neighbour-friendly holiday accommodation. As such, we no longer accept bookings from groups of single men only. We also kindly request that language and general behaviour remains respectful at all times. Please note that parties are not allowed at any Away at Byron Bay property. Any breach of the above policy conditions permits us to amend rent of premises, make a claim against the security bond or to immediately terminate the tenancy at the guest's expense. Unacceptable noise that results in neighbour complaints at a property will attract a minimum fee of $200 deducted from the security bond. The person signing on the form will be the person who accepts responsibility for property damage and any other breaches of the terms and conditions. I have read the “AWAY AT BYRON BAY PROPERTY AGREEMENT” and hereby accept these conditions.